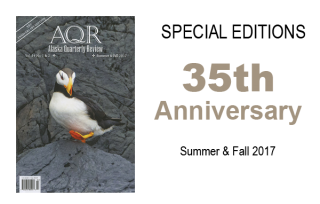 In the twenty-five years since Alaska Quarterly Review (AQR) published its first issue in fall of 1982, the average human heart beat 875 million times, the Earth wobbled on its axis, and glaciers in Alaska and around the globe retreated. In 1982 we were not using laptop computers, deleting spam, or making movies with our cell phones. Ronald Reagan was president and Gabriel García Márquez won the Nobel Prize for Literature. Joe Hazelwood hadn’t run the Exxon Valdez aground on Bligh Reef, and 9 -11 was just another day. The world we live in now does not feel like the same place. But at AQR, some things have remained constant: the energy and enthusiasm of new writers, the stack of waiting manuscripts, and never having enough space in our pages to provide a home for all the submissions we might hope to publish. We’ve done our best to stay true to our course — to create a national, front-line literary journal featuring new and emerging writers, poets, playwrights, essayists, and photographers. It’s been a privilege to produce a reliable, high-quality venue for their literary voices. Twenty-five years. 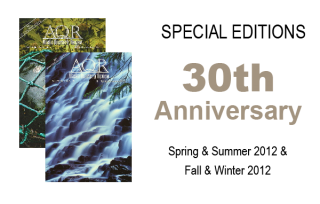 Let’s lift a glass by its delicate crystal stem and make a toast to our editorial team, past and present, for whom AQR has been a labor of love. And let’s raise that glass again to express heart-felt gratitude to all of our readers and supporters for sustaining us for a quarter of a century.